> Multiple Spray Setting: Versatile shower head features three spray modes, saturating, spray and massage. Offer you multiple unparalleled shower experiences. 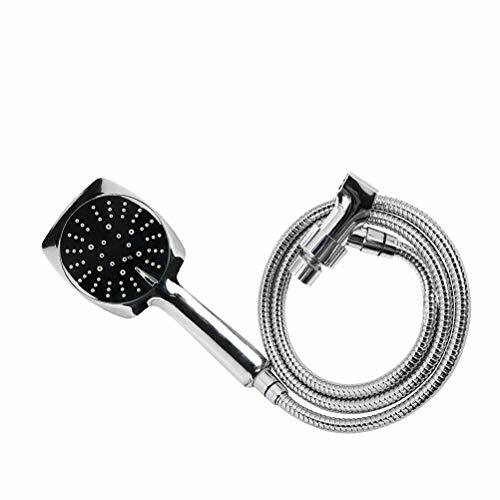 > This premium hand held showerhead is made with strong quality ABS & chrome polish, all around finish features a modern and elegant look. Never tarnish and resisting spots. > Lasting Finish Resists corrosion & wear. Quality material for applicability, simplicity and reliability. > Chrome finish all around the head shower to handle nice hot showers and mounted with solid connection bracket - for maximum durability and flexibility, no cracks and leaks anymore! > Flexible, long hose: An long super flexible stainless steel 60" hose. It's easy for you to shower yourself, your kids, your pets or showering the toilet. Quality construction refuses all the leaking and winding, allowing maximum flexibility and convenience. > Easy installation: No need to call a plumber - Installs in minutes with just one hand-tighten connection. > This is a premium handheld shower heads at affordable price. Shower hand: Quality ABS & chrome polish, chrome/grey of faceplate, gray of nozzles. Stainless Steel Hose: Quality stainless steel material features , with brass connection. 2 rubber washers to strengthen the sealing, anti-leakage, corrosion-resistant. Shower head bracket mount: ABS plating, G1/2'' connection, fits most standard shower hose nozzle. Handheld shower head is with its 4.3'' inches width size of the head. Stainless Steel Hose: 60 inch''.